I've been home sick with something of the gastro variety - possibly even a repeat of giardia. Anywhoo this time I had a raging high temperature for 5 hours and slept for the better part of 36 hours (waking for bathroom visits and not much else). I wasn't worth much - it took me 6 hours to make a coffee from turning the kettle on the first time, to drinking it cold out of hard hearted pragmatism. I've no sewing progress to share, so I'll talk about a crochet wool blanket I've wanted to make for about 4 years. I roughly knew the colours I wanted (light green & lavender) and that it should be motifs rather than rows. Practicality, because the one I made *cough* years ago got very bulky to carry around near the end. This way I can work on it on the bus or at work lunchtime, but only take 1 colour and batches of motifs with me not the whole blanket. 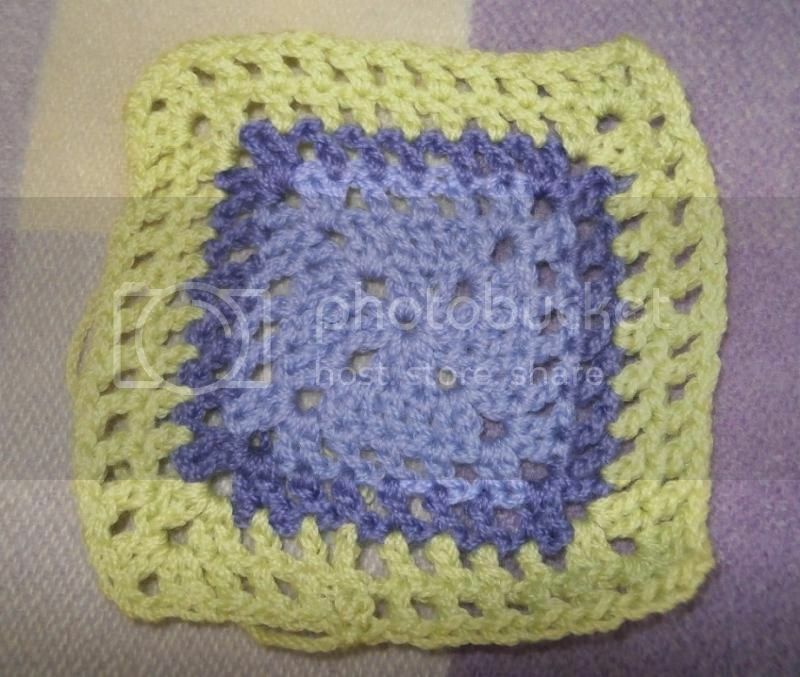 After testing out a couple of ideas, I've gone for a netted granny square. The first sample I made was this one. 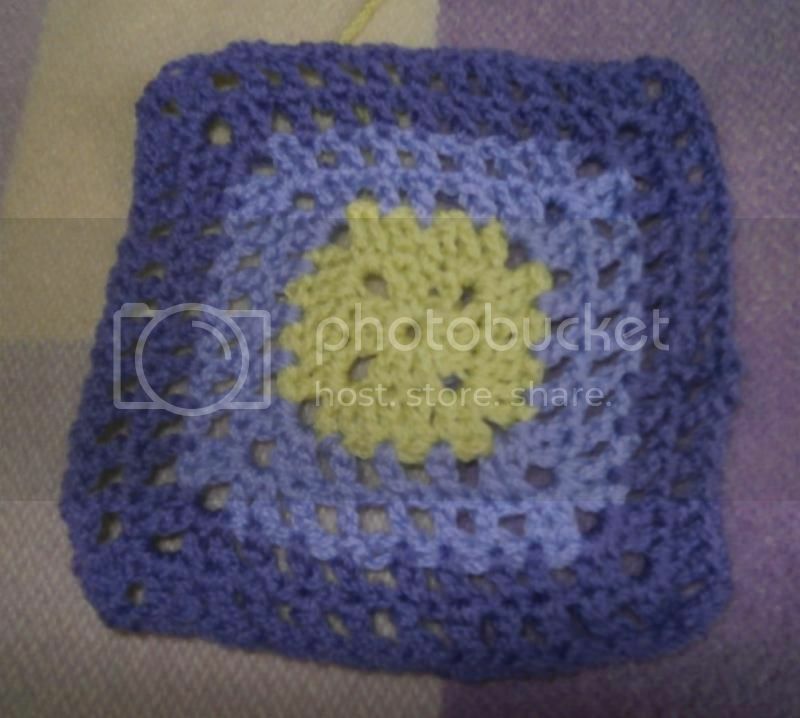 (I've not blocked the squares so they could look prettier). However, I didn't like it this way (not that I expected to) and wasn't sure what it was that niggled. So I looked back at my inspirations and they all had the lightest colour in the centre, so that's what I tried next. Along with balanced rows of colour. I hadn't planned to use the darker of the 2 purples, but it was flat without it, so I undid the row of green and put in the darker. What I love about crochet is that I don't mind undoing as it's so quick to do (compared to knitting. I'm a very slow knitter). I calculated that I'll need 120 of these (10 x 12) and will work in batches of 12, crocheting or darning any ends in as each batch is done so that it's not a monumental task by the end. That would lead to procrastination and avoidance. Not likely to be finished by the end of this winter, but I'll get a good start on it, and will know how many more balls of wool to order from Bendigo Woollen Mills. Using Classic 8ply in Celery, Aster & Blueberry. Lovely crochet motif - the colours work well. I like the last one the best too.